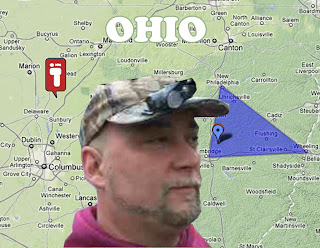 Tonight's Finding Bigfoot episode is titled "Buckeye Bigfoot" and takes place, as you might guess, Ohio. The episode description: The team travels to Ohio to investigate an alleged close encounter with a bigfoot caught on tape. They assemble a group of volunteers to search a notorious forest for evidence, in hopes of proving bigfoots exist in Ohio. 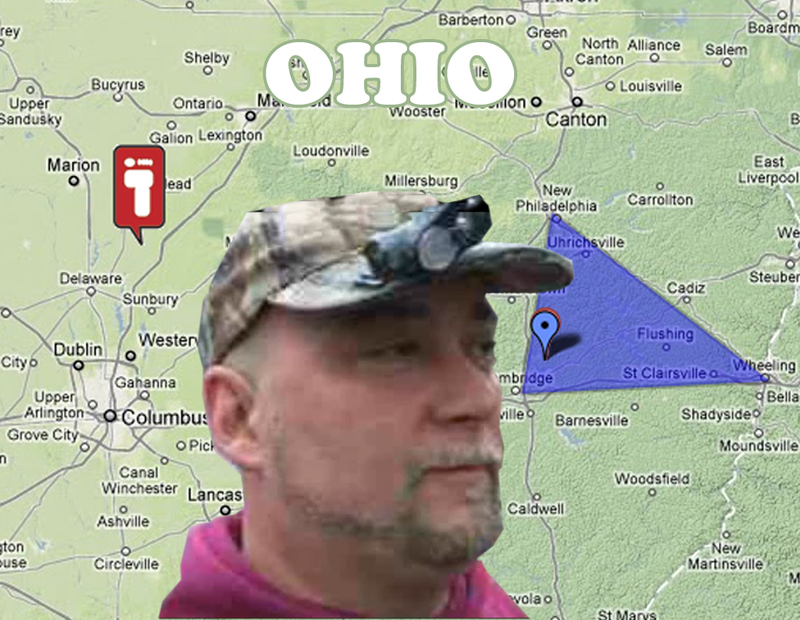 One of the people we will meet in Ohio, will be Tim Stover Jr. Who has been searching for Bigfoot for nearly 20 years. Tim Stover Jr. holds a 17-inch-long plaster cast of a strange impression he found in November in the woods at West Branch State Park in northeastern Ohio. It was one of seven imprints that led from a creek bed up a hill. A friend spotted it several yards from where Stover discovered a deer that was untouched except for a snapped neck. There was a time that the lifelong Kent resident would have been embarrassed to utter the name of the beast he thinks could have made those prints and killed the deer. But experience and the support of fellow believers has erased any trepidation. “You can sort of see the toes here,” he said, pointing to details in a mold made rough by forest-floor debris. Stover, 45, has been stalking Bigfoot for 20 years. The moment that set him off on his quest will be explored in the Animal Planet television series Finding Bigfoot, airing at 10 tonight. Stover was asked to re-enact the events of Oct. 6, 1992, in the spot where he was deer hunting at Salt Fork State Park near Cambridge. He said when he awoke that day, Bigfoot was no more real to him than the Loch Ness monster or aliens from Mars. All Stover wanted to see was a deer. But after sitting in a tree stand for six hours, he was ready to call it a day. As he was leaving the tree stand, he heard rustling coming from a ravine. Then he caught his breath at the sight before him. “It was a whitish, silvery-gray color, and as weird as it sounds, my first thought was it looked like a hairy old naked man of the woods,” Stover said. The thing looked in Stover’s direction, took a step or two toward him, then turned and walked away. That’s when he decided he had seen Bigfoot. The creature appeared to be more than 7 feet tall. Hair 2 to 3 inches long covered its body. The head was attached to broad shoulders by a thick neck. Since then, Stover has searched the woods around Portage County, closer to his home, hoping for another sighting. He has invested $8,000 in high-tech camera equipment, and when he’s not at his job as a remodeling contractor, he spends 30 to 40 hours a week exploring. He has no hard feelings for anyone who doesn’t believe in Bigfoot. “You can’t force anyone to believe something they’ve never seen,” Stover said. In central Ohio there is the Sasquatch Triangle. This triangle, including sections of Tuscarawas, Guernsey, Muskingum and Coshocton counties, is home to the most frequent Bigfoot sightings in the state. They also have a more specific name for their Bigfoot called the Ohio Grassman. Recently WKYC, an NBC-affiliated television station located in Cleveland, Ohio did a terrible job promoting next episode of Animal Planet's Finding Bigfoot by calling the show Bigfoot Hunters. You can read their blurb below, view a few videos with Tim Stiver Jr., and a interactive map of the Bigfoot Triangle in Ohio. Bigfoot spotted in Portage County? 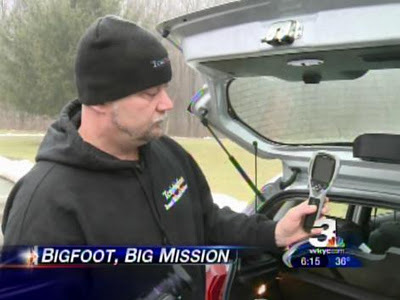 RAVENNA -- A local "Bigfoot" researcher says he's seen one in Ohio. Twenty years ago, deer hunter Tim Stover Jr. saw something in the woods that changed his life. "This thing was white, gray, silver-colored and hairy looking. It was a bipedal subject staring right at me," he recounts. He believes it was Bigfoot. Since then, Stover spends his free time in the woods searching for evidence of the hairy beast. He says he has found footprints in Northeast Ohio at West Branch State Park, located in Portage County. Stover says he and his son, plus a few like-minded friends, hike the woods near the state park's campground. During camping season, they even do seminars on Bigfoot and lead night hikes for Bigfoot researchers of all ages. The walks get people outside and generate real interesting stories around the campfire. Tim's story will be featured on the Animal Planet show "Bigfoot Hunters" [Fail!] this Sunday night.